A new Seven Seas G Unit meant to support Seven Seas Break Rides. 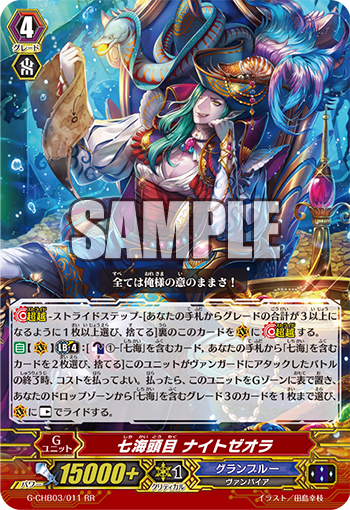 AUTO (VC) Limit Break 4: [Counter Blast 1 – “Seven Seas” card & Choose 2 “Seven Seas” cards from your hand, discard them] At the end of a battle in which this Unit attacks a Vanguard, you can pay the cost. If you pay it, place this Unit into the G Zone face-up, choose up to 1 Grade 3 “Seven Seas” card from your Drop Zone, and Ride it at Rest on (VC). For Today’s Card, we’re introducing a 《Granblue》 “Seven Seas” enhancing card from the 3rd Character Booster “Rummy Labyrinth in the Moonlight” (on sale March 3rd, 2017): “Seven Seas Boss, Nightseolla”. “Seven Seas Boss, Nightseolla”, once you’ve achieved Limit Break (i.e. once you have 4 or more damage) can allow you to activate its ability via Counter Blast 1 and discarding 2 “Seven Seas” cards from your hand! By returning “Nightseolla” to the G Zone face-up, you can choose 1 Grade 3 “Seven Seas” card in your Drop Zone and Ride it at Rest! If your Heart is a card with Limit Break, upon Riding, you can achieve a Break Ride! Its synergy with “Lord of the Seven Seas, Nightmist” is good, as after you attack with “Nightseolla”, you can activate the Break Ride of “Nightmist” Calling 2 Rear-guards with 5000 additional power, allowing you to launch consecutive attacks. Even a single copy can be expected to strengthen “Seven Seas”! “Rummy Labyrinth in the Moonlight” contains many cards that bolster “Seven Seas”, so look forward to further information!